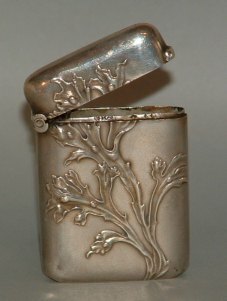 this is a silver matchbox holder (Vesta case) made in France at the end of 19th century/ beginning of 20th century, embossed with floral motif in the typical Art Nouveau style. 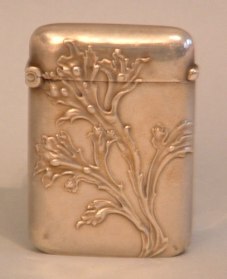 These pocket-sized cases for carrying matches took their name from 'Vesta', the deity that presided over the domestic focus (hearth) in Ancient Rome. She was the only goddess of the Roman pantheon who remained unformed and Her only contour emanated from Her residence at Rome which housed Vesta’s symbolic flame. A 'match' was the modern representation of Vesta's symbolic flame and was known as a 'vesta' up until the twentieth century when 'match' became the favoured term. 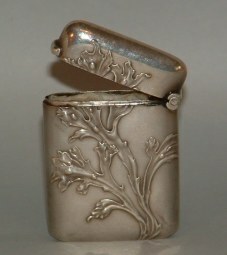 Vesta cases were in great use between the 1860's and 1940', but the invention of the pocket petrol lighter initiated a decline in the use of these items. This matchbox holder is 1 3/4 in. long (cm. 4,5) and was bought from a French dealer at an Antique Market in Paris.